Discussion in 'PC Tricks, Tutorials, Softwares And Solutions' started by Tunisblizz, Nov 26, 2016. It is a norm on Twitter and Instagram: people follow you for reasons best known to them. 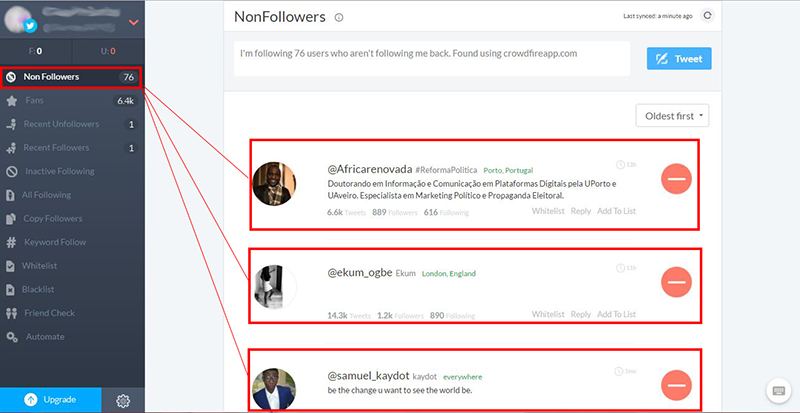 After a while, some of these followers – also for reasons best known to them – unfollow you. The painful thing is that you might have shown gratitude to this unfollower by following him back at the time he followed you. Now that he unfollows you, his posts keep running among other feeds on your page, but he gets none of yours. To add insult to injury, Twitter and Instragram wouldn’t let you know this guy has unfollowed you, so that you can unfollow him too and turn the game to what some people called you do me, I do you. Worst case scenario happens to people with followers in big Ks or Ms (Thousands and Millions). They don’t easily notice unfollows. 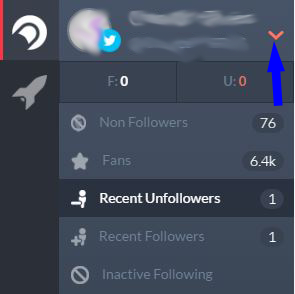 But folks with hundreds or tens of followers easily notice this and instantly start wondering who the hell just unfollowed them. In an effort to find this who-the-hell unfollower, they jump to their followers’ list, do some scrolling through to see if they can fish out the person. This method, however, has never worked for anybody. 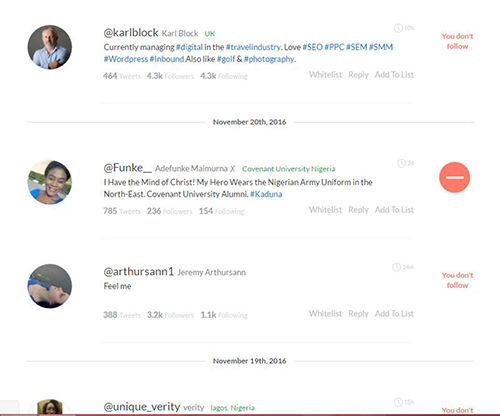 And if you are among the people with big Ks or Ms of followers, you dare not scroll through your massive list. But worry not. I know a way you can use to know any who-the-hell unfollower that unfollows you on Twitter and Instagram. All you need to do for now is to keep reading. The steps described in this post are done on a computer, nevertheless the sequence is the same on phones. * Launch your browser and go to https://www.crowdfireapp.com/. * On the homepage, click on SIGN IN WITH TWITER; you can sign in with Instragam, too. * Input your Twitter username and password to login. * After you login, click on Authorize App; a dashboard will load after authorization. * On the dashboard, click on Non Followers. Non followers are people you followed but didn’t follow back. * Click on Recent Unfollowers to see the faces of people who decided to unfollow you. * On the left hand options, click on the V sign. * Click on the Instagram Icon to add your Instagram account. * Input your username and password to login to Instagram. * Click on Authorize to authorize Crowdfire. * After authorizing and adding your Instagram account, click on Recent Unfollowers to also see people that unfollow you. 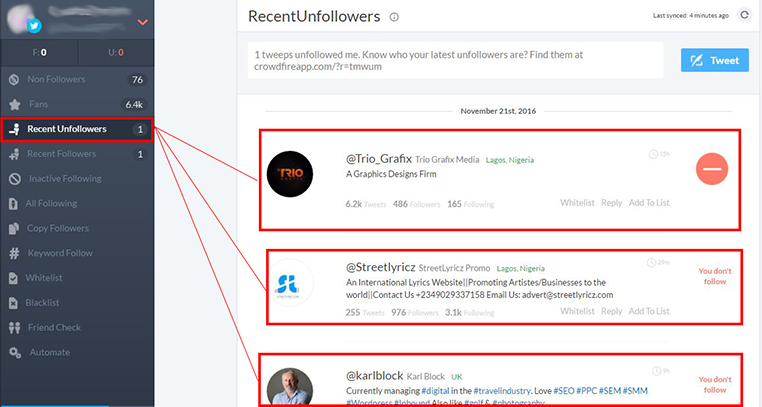 By now, you should know the who-the-hell guy that unfollows you. The ball is in your court; If you like you can unfollow him, too. If you trust apps than websites, download Crowdfire android app.